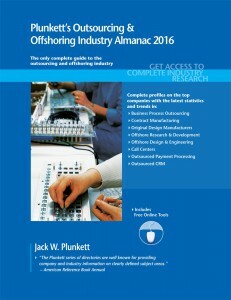 Seif Hamed - Plunkett Research, Ltd.
HOUSTON, Texas – Plunkett Research, Ltd. recently announced an important market research and competitive analysis report, Plunkett’s Banking, Mortgages & Credit Industry Almanac, 2018 edition. A complete market research report, including forecasts and market estimates, technologies analysis and developments at innovative firms. Plunkett Research lists top 400 companies in the Banking, Mortgages & Credit business and names the top trends changing for the mid term. This entry was posted in News on November 3, 2017 by Seif Hamed. HOUSTON, Texas – Plunkett Research, Ltd. recently announced an important market research and competitive analysis report, Plunkett's Education, EdTech & MOOCs Industry Almanac 2015 edition. A complete market research report, including forecasts and market estimates, technologies analysis and developments at innovative firms. It would be hard to think of an industry facing more change than education. Venture capital is pouring into companies that are developing new ways to teach, learn and communicate with students. New technologies are entering the market at blinding speed. At the same time, demand for better education and broader access to education is soaring in emerging nations from India to Africa to China. In the U.S., more than ever before, students, parents, taxpayers and government officials are questioning the costs, efficiency and results of both higher and lower education paradigms.